Amber Young, 25, of Cleveland matched into obstetrics and gynecology at the Warren Alpert Medical School of Brown University in Providence, Rhode Island. The fourth-year medical student at the University of Cincinnati (UC) College of Medicine got her top choice. Her boyfriend stood at her side in Kresge Auditorium as she opened the envelope that would reveal where she will spend the next four years in residency training. Cheers from her classmates and a few tears from Young made the day truly special. It was all part of Match Day, an annual event managed by the National Residency Matching Program (NRMP), which pairs the preference of medical students with those of residency programs to create optimal matches. “I think a lot of people have been nervous, but excited to find out where they are going to be,” says Young. 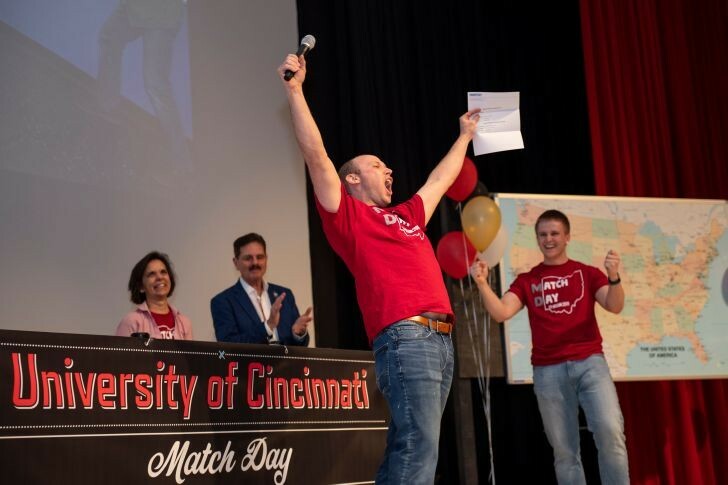 At UC, 183 medical students successfully matched into specialties across the country. Zachary Crawford , a fourth-year medical student, matched into orthopedic surgery. He will do residency at UC Medical Center. UC students matched to programs at such schools and hospitals as Harvard, Johns Hopkins, Duke, Mayo Clinic, Cleveland Clinic, Washington University in St. Louis, UCLA, Case Western, Vanderbilt and UT Southwestern. Of the 183 matched students, 48 will do at least part of their residency at hospitals in Greater Cincinnati. Of those, 28 will stay at UC Medical Center, seven at Christ Hospital, six at Cincinnati Children’s, three each at Good Samaritan and Jewish hospitals and one at Bethesda North Hospital. The most popular primary residencies were Internal Medicine with 28 students, Emergency Medicine and Family Medicine, both with 18 students, and Pediatrics with 16 students. Some specialties require students to complete preliminary residencies of one or two years of training prior to entering an advanced period of specialty training. These preliminary residences may also be counted in the final Match Day tally.